Making the M4 a ‘smart motorway’ between junctions 3 and 12. We've introduced a new engagement tool where you can give your views on the project. Please click on the map below to add your comments about specific parts of the route. 2019 will see a step up in the project as we move forward with bridges and structures work and prepare for the start of phase 2 of construction between junctions 8 and 9 at Maidenhead and junction 3 at Hayes. We're now moving into the new office and compound near junction 10 which recently finished construction. The new compound will allow us to store our equipment and materials and reduce the need for large local compounds. 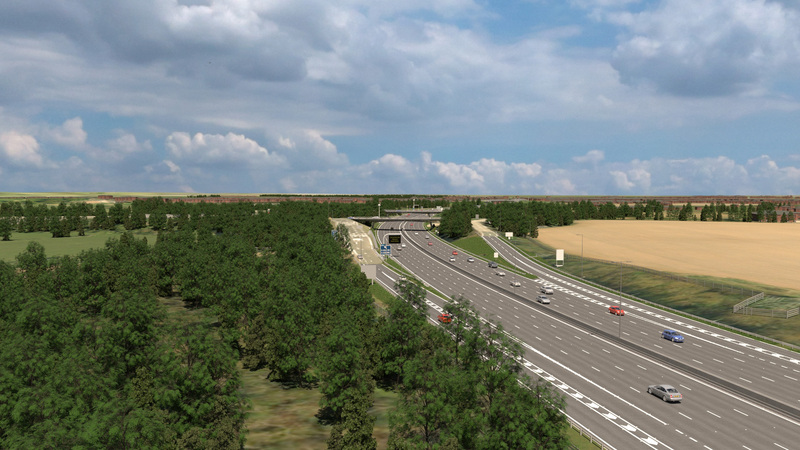 It will also provide space for vehicle rescue and recovery facilities for users of the M4. The best way to keep up to date with the various closures, including slip road closures, is the Traffic England website. Note: In the event of poor weather conditions or other issues out of our control, planned works may be postponed at short notice. If works complete ahead of schedule the motorway may reopen early. Signage will be in place to update road users of changes. In March and April 2019 we held public information events for areas between junctions 3 at Hayes and junction 8/9 at Maidenhead ahead of the next phase of the works. We will also be holding pop-up exhibitions at shopping centres, supermarkets, business parks, and major employment locations throughout the rest of the project. Details of these will be posted on our webpages. You can find out more about our plans in our latest smart motorway exhibitions leaflet and the display material we used, which you can find below in the media and documents section. This is the longest smart motorway project in England to date (51km, 32 miles). We have carefully planned our work to minimise disruption to our drivers and communities. We started main works between junction 8/9 and 10 in July 2018 and have since progressed our traffic management west towards junction 12, and east towards junction 6. In tandem we have started enabling work on four bridges between junction 8/9 and junction 7. The more complex section of the scheme, progressing east towards junction 3, will be started in May 2019. Our overall timetable is under review at present and we will post an update in due course, however the completion date for the project as a whole is Spring 2022. Any changes will be published on our project web pages on a regular basis. To limit local disruption, new bridges will be built next to the existing ones, before the old one is demolished. However, where there is not enough space for this, some bridges will be demolished first, then a new bridge built in the same place. Where the motorway passes over, for example, the River Thames at Bray and the railway line to Windsor, we will need to widen structures to support the new smart motorway. Wherever possible, noisier works will be undertaken during daytime hours to reduce disturbance. There will be temporary closures of the carriageway and slip roads at night on some occasions. In these instances, the closure will be advertised, and advance warning signs and clearly signed diversions will be put in place. You can use the Roadworks section below to find information about roadworks as the scheme progresses. The construction of the scheme will be governed by the Construction, Design and Management Regulations, and we will be a member of the Considerate Constructors scheme which will help ensure that we are a good and responsible neighbour. Further details will be provided on these project web pages as they become available both before and during construction. Please sign up for updates using the link on the right if you would like to receive notifications when the web page is updated. The M4 is the main strategic route between London, the West of England and Wales. It connects people, communities and businesses, carrying on average 130,000 vehicles per day and is prone to congestion. This scheme will use the latest technology to improve journeys by monitoring traffic flow and setting speed limits accordingly. This helps to keep traffic moving smoothly, instead of continually stopping and starting. Information about road conditions and speed limits will be displayed to drivers on electronic road signs. The proposal also involves converting the hard shoulder permanently to a traffic lane. This will create much needed extra capacity necessary to support economic growth. All Lane Running: between junctions 3 and 12 the hard shoulder will be converted to a traffic lane, so that there are four lanes available for use by road users. Between junctions 4 and 4b, there will be five lanes. 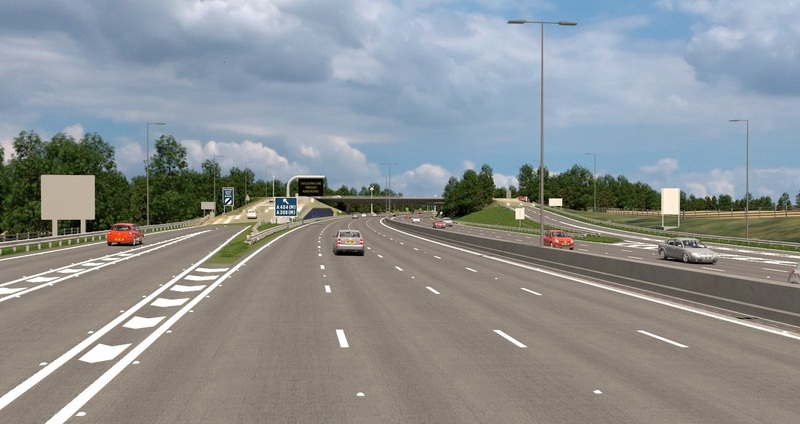 Where a hard shoulder does not currently exist, the motorway will be adapted to create a minimum of four lanes. The barrier in the central reservation will be replaced by a new concrete barrier. Through junction running: This enables a consistent number of lanes to pass through the junction, reducing the need to change lane for vehicles staying on the motorway. 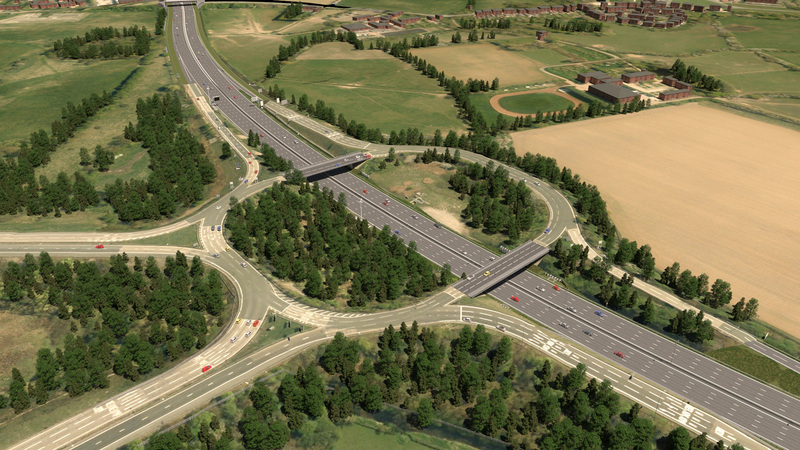 Through-junction running will be in place at junctions 4, 6, 7, 8/9 and 11 and at the Reading motorway service area. Where the motorway passes over, for example, the River Thames at Bray and the railway line to Windsor, we will need to widen bridges to support the new smart motorway. Emergency areas (EAs): there will be new high visibility Emergency Areas between junctions 3 and 12. Places of relative safety will be every 1.12 miles on average and no more than 1.6 miles apart. If you are driving at 60mph you will pass one approximately once every 90 seconds. The DCO process was established by the Planning Act 2008 and is used for certain large and complex schemes (including highway improvements) that have been designated as a Nationally Significant Infrastructure Project (NSIP) by the Government. The benefits of the DCO process include extensive pre-application consultation, detailed analysis, including a full Environmental Impact Assessment, and examination by an independent inspector before the final decision is made. All of the DCO requirements needed to start work were discharged in summer 2018. The construction of the scheme is governed by the Construction, Design and Management Regulations, and we're a member of the Considerate Constructors scheme which will help ensure that we're a good and responsible neighbour. During the examination of the application, further environmental protections were requested and planning requirements attached to the consent. Location : The M4 eastbound between junctions J10 and J8 . Reason : Roadworks scheme. Status : Currently Active. Period : from 20:02 on 25 April 2019 to 05:30 on 13 May 2019. Location : The M4 eastbound between junctions J11 and J10 . Lane Closures : Lanes 1 and 2 will be closed. Reason : Roadworks are planned. Status : Pending. Schedule : From 20:00 on 26 April 2019 to 07:00 on 27 April 2019. Schedule : Expect disruption everyday between 20:00 and 05:30 from 29 April 2019 to 3 May 2019. Schedule : From 20:00 on 3 May 2019 to 07:00 on 4 May 2019. Schedule : Expect disruption everyday between 20:00 and 05:30 from 7 May 2019 to 10 May 2019. Lanes Closed : There will be two of three lanes closed. Location : The A308M westbound between the junctions with the A308 and the M4 . Lane Closures : Lane one will be closed. Reason : Roadworks are planned. Status : Pending. Schedule : Expect disruption everyday between 20:00 and 05:30 from 1 May 2019 to 3 May 2019. Schedule : From 20:00 on 3 May 2019 to 07:00 on 4 May 2019. Lanes Closed : There will be one of two lanes closed. Location : The A308M eastbound between the junctions with the M4 and the A308 . Lane Closures : Lanes 1 and 2 will be closed. Reason : Roadworks are planned. Status : Pending. Schedule : From 21:00 on 25 April 2019 to 05:30 on 26 April 2019. Schedule : From 21:00 on 26 April 2019 to 06:00 on 27 April 2019. Lanes Closed : All lanes will be closed. Location : The M4 westbound entry slip at junction J10 . Lane Closures : Lane one will be closed. Reason : Roadworks are planned. Status : Pending. Schedule : Expect disruption everyday between 20:00 and 05:30 from 29 April 2019 to 3 May 2019. Schedule : From 20:00 on 3 May 2019 to 07:00 on 4 May 2019. Schedule : Expect disruption everyday between 20:00 and 05:30 from 7 May 2019 to 10 May 2019. Schedule : From 20:00 on 10 May 2019 to 07:00 on 11 May 2019. Lanes Closed : All lanes will be closed. Location : The M4 westbound between junctions J8 and J10 . Reason : Roadworks scheme. Status : Currently Active. Period : from 20:04 on 25 April 2019 to 07:00 on 4 May 2019. Location : The A404M southbound between junctions J9A and J9 . Lane Closures : Lane one will be closed. Reason : Roadworks are planned. Status : Pending. Schedule : Expect disruption everyday between 20:00 and 05:30 from 1 May 2019 to 3 May 2019. Schedule : From 20:00 on 3 May 2019 to 07:00 on 4 May 2019. Lanes Closed : There will be one of two lanes closed. Location : The A308M westbound between the junctions with the A308 and the M4 . Lane Closures : Lanes 1 and 2 will be closed. Reason : Roadworks are planned. Status : Pending. Schedule : From 21:00 on 25 April 2019 to 05:30 on 26 April 2019. Schedule : From 21:00 on 26 April 2019 to 06:00 on 27 April 2019. Lanes Closed : All lanes will be closed. Location : The M4 westbound between junctions J6 and J10 . Reason : Roadworks scheme is planned. Status : Pending. Schedule : From 20:00 on 29 April 2019 to 05:30 on 13 May 2019. Location : The M4 westbound exit slip at junction J6 . Lane Closures : Lane one will be closed. Reason : Roadworks are planned. Status : Pending. Schedule : From 20:00 on 26 April 2019 to 07:00 on 27 April 2019. Schedule : Expect disruption everyday between 20:00 and 05:30 from 29 April 2019 to 3 May 2019. Schedule : From 20:00 on 3 May 2019 to 07:00 on 4 May 2019. Schedule : Expect disruption everyday between 20:00 and 05:30 from 7 May 2019 to 10 May 2019. Lanes Closed : There will be one of two lanes closed. Location : The M4 eastbound between junctions J11 and J8 . Reason : Roadworks scheme is planned. Status : Pending. Schedule : From 20:00 on 2 May 2019 to 07:00 on 4 May 2019. Location : The M4 westbound entry slip at junction J7 . Lane Closures : Lanes 1 and 2 will be closed. Reason : Roadworks are planned. Status : Pending. Schedule : From 20:00 on 2 May 2019 to 05:30 on 3 May 2019. Schedule : From 20:00 on 3 May 2019 to 07:00 on 4 May 2019. Lanes Closed : All lanes will be closed. Location : The M4 westbound between junctions J10 and J12 . Lane Closures : Lanes 2 and 3 will be closed. Reason : Roadworks are planned. Status : Pending. Schedule : Expect disruption everyday between 20:00 and 05:30 from 29 April 2019 to 2 May 2019. Lanes Closed : There will be two of three lanes closed. Location : The M4 westbound between junctions J10 and J12 . Reason : Roadworks are planned. Status : Pending. Schedule : From 09:00 on 29 April 2019 to 05:30 on 24 May 2019. Location : The M4 eastbound between junctions J10 and J8 . Lane Closures : Lanes 2 and 3 will be closed. Reason : Roadworks are planned. Status : Pending. Schedule : From 20:00 on 26 April 2019 to 07:00 on 27 April 2019. Schedule : Expect disruption everyday between 20:00 and 05:30 from 29 April 2019 to 3 May 2019. Schedule : From 20:00 on 3 May 2019 to 07:00 on 4 May 2019. Schedule : From 20:00 on 11 May 2019 to 07:00 on 12 May 2019. Lanes Closed : There will be two of three lanes closed. Location : The M4 westbound between junctions J10 and J12 . Reason : Roadworks scheme is planned. Status : Pending. Schedule : From 20:00 on 29 April 2019 to 05:30 on 2 May 2019. Location : The M4 westbound between junctions J6 and J10 . Lane Closures : Lanes 2 and 3 will be closed. Reason : Roadworks are planned. Status : Pending. Schedule : Expect disruption everyday between 20:00 and 05:30 from 29 April 2019 to 3 May 2019. Schedule : From 20:00 on 3 May 2019 to 07:00 on 4 May 2019. Schedule : From 20:00 on 11 May 2019 to 07:00 on 12 May 2019. Schedule : From 21:00 on 12 May 2019 to 05:30 on 13 May 2019. Lanes Closed : There will be two of three lanes closed. Location : The M4 eastbound entry slip at junction J10 . Lane Closures : Lanes 1 and 2 will be closed. Reason : Roadworks are planned. Status : Pending. Schedule : From 20:00 on 24 April 2019 to 05:30 on 25 April 2019. Schedule : Expect disruption everyday between 20:00 and 05:30 from 29 April 2019 to 1 May 2019. Lanes Closed : All lanes will be closed. Location : The M4 eastbound entry slip at junction J10 . Lane Closures : Lane one will be closed. Reason : Roadworks are planned. Status : Pending. Schedule : From 20:00 on 2 May 2019 to 05:30 on 3 May 2019. Schedule : From 20:00 on 3 May 2019 to 07:00 on 4 May 2019. Lanes Closed : All lanes will be closed. Location : The M4 westbound between junctions J8 and J10 . Lane Closures : Lanes 1 and 2 will be closed. Reason : Roadworks are planned. Status : Pending. Schedule : From 20:00 on 26 April 2019 to 07:00 on 27 April 2019. Schedule : From 20:00 on 29 April 2019 to 05:30 on 30 April 2019. Schedule : Expect disruption everyday between 20:00 and 05:30 from 1 May 2019 to 3 May 2019. Schedule : From 20:00 on 3 May 2019 to 07:00 on 4 May 2019. Lanes Closed : There will be two of three lanes closed. Location : The M4 westbound between junctions J11 and J12 . Lane Closures : Lanes 1 and 2 will be closed. Reason : Roadworks are planned. Status : Pending. Schedule : From 20:00 on 26 April 2019 to 07:00 on 27 April 2019. Schedule : Expect disruption everyday between 20:00 and 05:30 from 29 April 2019 to 3 May 2019. Schedule : From 20:00 on 3 May 2019 to 20:00 on 4 May 2019. Schedule : Expect disruption everyday between 20:00 and 05:30 from 7 May 2019 to 10 May 2019. Lanes Closed : There will be two of three lanes closed. Location : The M4 westbound between junctions J5 and J6 . Lane Closures : Lanes 1 and 2 will be closed. Reason : Roadworks are planned. Status : Pending. Schedule : Expect disruption everyday between 20:00 and 05:30 from 1 May 2019 to 3 May 2019. Schedule : From 20:00 on 3 May 2019 to 07:00 on 4 May 2019. Lanes Closed : There will be two of three lanes closed. Location : The M4 eastbound entry slip at junction J7 . Lane Closures : Lanes 1 and 2 will be closed. Reason : Roadworks are planned. Status : Pending. Schedule : Expect disruption everyday between 20:00 and 05:30 from 1 May 2019 to 3 May 2019. Schedule : From 20:00 on 3 May 2019 to 07:00 on 4 May 2019. Lanes Closed : All lanes will be closed. Location : The M4 eastbound between junctions J11 and J8 . Lane Closures : Lanes 1 and 2 will be closed. Reason : Roadworks are planned. Status : Pending. Schedule : From 20:00 on 2 May 2019 to 05:30 on 3 May 2019. Schedule : From 20:00 on 3 May 2019 to 07:00 on 4 May 2019. Lanes Closed : There will be two of three lanes closed. Location : The M4 westbound between junctions J10 and J11 . Lane Closures : Lanes 1 and 2 will be closed. Reason : Roadworks are planned. Status : Pending. Schedule : From 20:00 on 26 April 2019 to 07:00 on 27 April 2019. Lanes Closed : There will be two of three lanes closed. Location : The M4 eastbound between junctions J11 and J7 . Lane Closures : Lanes 1, 2 and 3 will be closed. Reason : Roadworks are planned. Status : Pending. Schedule : From 20:00 on 30 April 2019 to 05:30 on 1 May 2019. Schedule : Expect disruption everyday between 20:00 and 05:30 from 21 May 2019 to 23 May 2019. Lanes Closed : All lanes will be closed. Location : The M4 westbound between junctions J10 and J12 . Reason : Roadworks scheme is planned. Status : Pending. Schedule : From 20:00 on 29 April 2019 to 07:00 on 12 May 2019. Location : The M4 westbound between junctions J10 and J12 . Lane Closures : Lanes 1 and 2 will be closed. Reason : Roadworks are planned. Status : Pending. Schedule : Expect disruption everyday between 20:00 and 05:30 from 29 April 2019 to 3 May 2019. Schedule : From 20:00 on 3 May 2019 to 07:00 on 4 May 2019. Schedule : Expect disruption everyday between 20:00 and 05:30 from 7 May 2019 to 10 May 2019. Schedule : Expect disruption everyday between 20:00 and 07:00 from 10 May 2019 to 12 May 2019. Lanes Closed : There will be two of three lanes closed.